WAMP, MAMP, and LAMP are abbreviations for “Windows, Apache, MySQL, and PHP,” “Mac, Apache, MySQL, and PHP,” and “Linux, Apache, MySQL, and PHP,” respectively. These abbreviations describe a fully functioning setup used for developing dynamic Internet web pages. WAMPs, MAMPs, and LAMPs come in the form of a package that binds the bundled programs together so that you don’t have to install and set them up separately. This means you can simply download and install a single program and follow a few easy prompts to get your web development server up and running in the quickest time with the minimum hassle. During installation, several default settings are created for you. The security configurations of such an installation will not be as tight as on a production web server, because it is optimized for local use. For these reasons, you should never install such a setup as a production server. There are several available WAMP servers, each offering slightly different configurations, but probably the best is Zend Server CE (where CE stands for Community Edition), because it’s free and is from the developers of PHP itself. 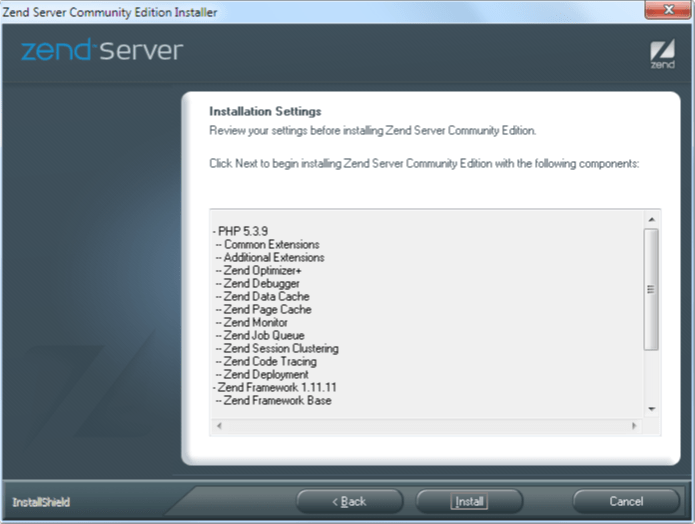 You can download it from http://www.zend.com/en/community/downloads . I recommend you always download the latest stable release. The page should display the correct installer for your computer: Linux, Windows, or OS X. You will be asked to log in before you download. You can click a link to get the file without logging in or registering, but you’ll miss out on product update emails and other news. Here I have taken a older version 5.6.0 SP1 for windows. 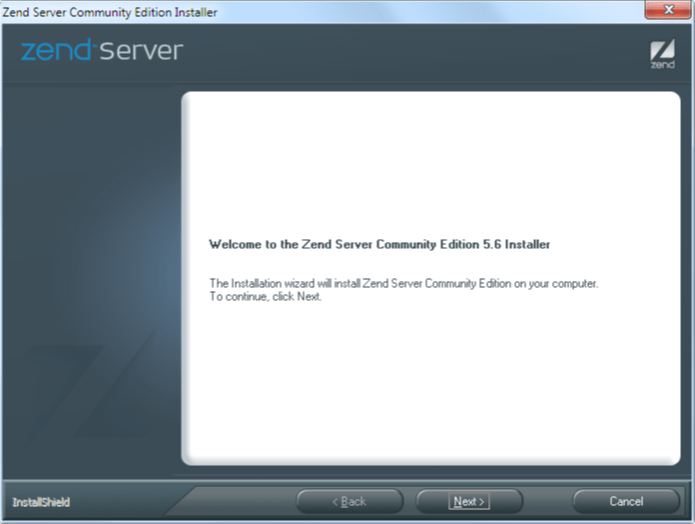 Once downloaded, follow below Zend Server Installation Guide to complete the installation. 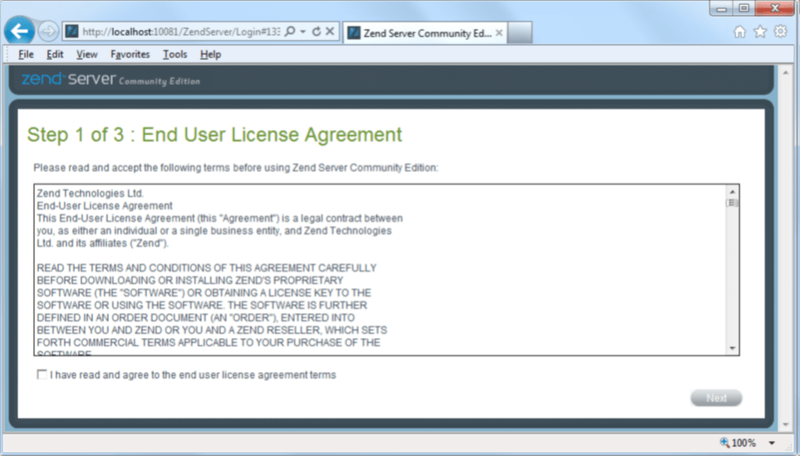 Click Next and accept the license agreement that follows to move on to the “Setup Type” screen. 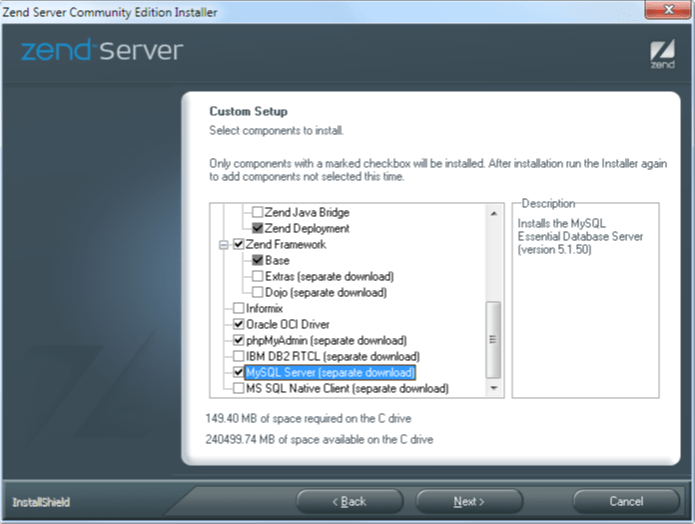 Select the “Custom” option so that the MySQL server can also be installed. On the following screen , even if you already have an IIS web server installed, I recommend that you choose to install the Apache web server. 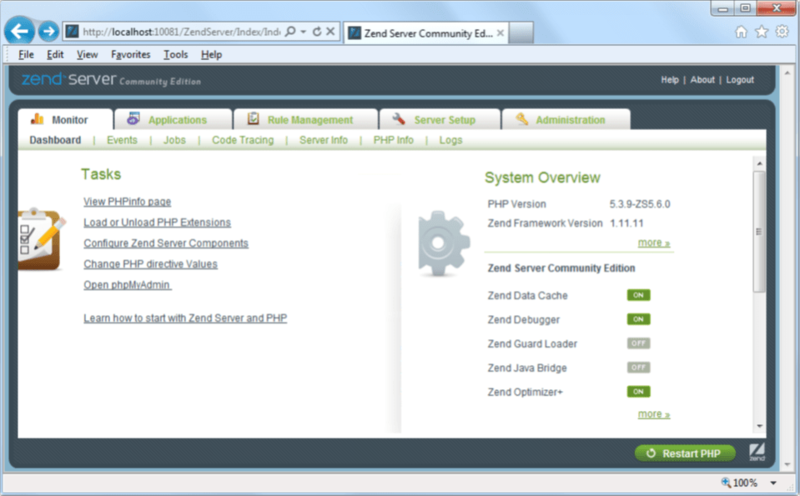 Accept the default values of 80 for the web server port and 10081 for the Zend server interface port and click Next. Tip: If either of the ports offered states that it is occupied (generally this will be because you have another web server running) and you can’t use the default, try a value of 8080 (or 8000) for the web server port and 10082 for the Zend server interface port. 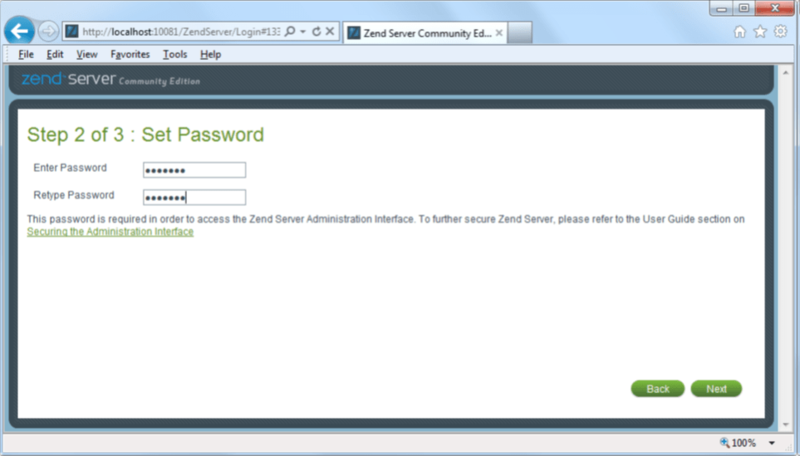 Remember to use these values later when accessing either web pages or the Zend server. For example, instead of visiting http://localhost/index.htm in your web browser, you would use http://localhost:8080/index.htm. During installation some extra files may be downloaded, so it may take a few minutes for the programs to get set up. When they are ready you will be notified that you can start using the software by clicking Finish. When you do so your default browser will be opened up with the page shown in Figure, where, to continue, you must check the box to agree with the terms. Now you are ready to set a password. Make sure you choose one you will remember, and click Next to proceed to the screen shown in Figure, where you can now click Finish. Finally your browser will show the Dashboard screen in below figure, which is the place where you can administer the server. 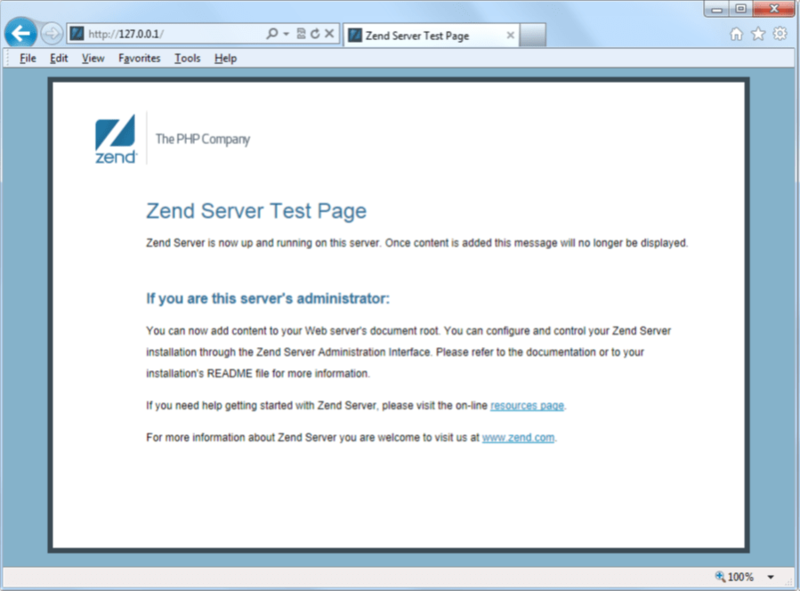 You can return to this screen at any time by entering http://localhost:10081 into your browser (or, if you entered a value other than 10081 for the Zend server interface port, you can get to this screen by using that value after the colon instead). The first thing to do at this point is verify that everything is working correctly. To do this, you are going to try to display the default web page, which will have been saved in the server’s document root folder. The document root is the directory that contains the main web documents for a domain. This is the one that is entered when a basic URL without a path is typed into a browser, such as http://yahoo.com, or, for your local server, http://localhost. You should now have had a trouble-free installation, resulting in a fully working WAMP. But if you encountered any difficulties, check out the comprehensive documentation at http://kb.zend.com/, which should sort out your problem. When software is updated, it sometimes works differently than you’d expected, and bugs can even be introduced. 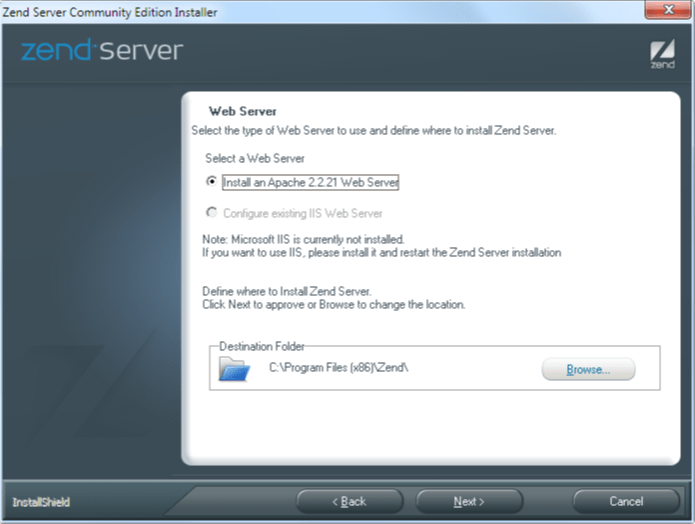 If you encounter difficulties with Zend Server CE that you cannot resolve, you may prefer to choose one of the various other solutions available on the Web instead. You will still be able to make use of all the examples in this book, but you’ll have to follow the instructions supplied with each WAMP, which may not be as easy to follow as the preceding guide.